Have you found an online vendor selling Depaz Blue Cane Amber? 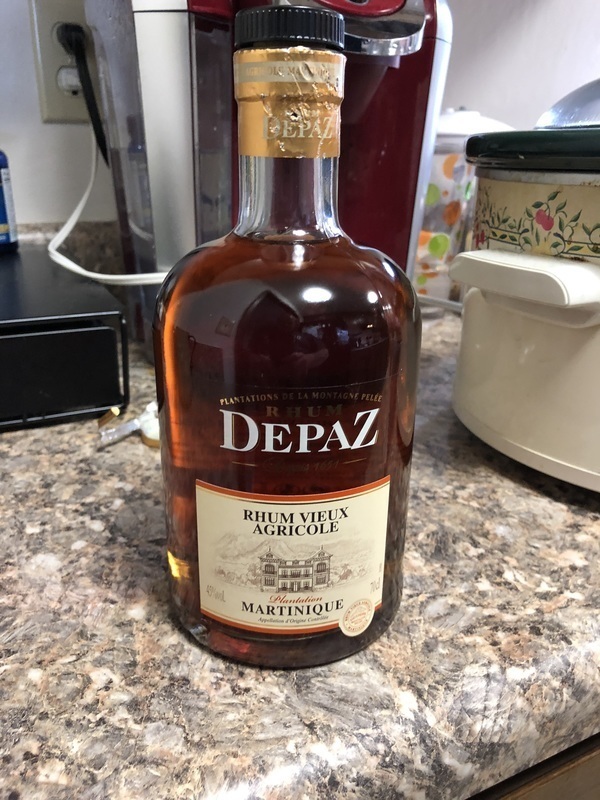 I bought a bottle of Depaz Blue Cane Amber Rhum based on the largest liquor stores recommendation in Manhattan and what a disappointment. There are so many better flavored Rhum Agricole's out there, so skip this one. Nasty burn and very off putting flavors. taste substantially different from most rums. It has a grassy, vegetal taste and reminds me a lot of a tequila. At first when I got my bottle I wasn't a fan, but either it grew on me or oxidation changed the taste more to my liking because now I find it quite interesting. When I had this my notes were sharp and ricey. At the time I assumed better as a mixer. Had it alongside flor de Caña 7 year. My palate has evolved some so I’ll try it again and maybe my rating will change. Perusing through all of my ratings for rhum agricoles, it seemed like an impossibility to pair great taste with a decent price. Most of the ones that I have yet to try are seriously overpriced. Many months ago, I remember looking up reviews on this one, but it was nowhere to be found on liquor store shelves in my area. Well today, I ran across a bottle of this for only $31 and figured that it could rate as a 7 at best. I poured a half ounce into the snifter and let it breathe for a while. The aroma is very unique, possibly from the rare blue cane used to distill it. The taste is super smooth and buttery and is one of those rums that it would be all too easy to consume the whole bottle neat. My goodness, this stuff is close to heaven! It makes a great Mai Tai when perfectly paired to Smith & Cross Traditional Jamaican rum, but why waste it as a mixer. However, it is cheap enough to do such a thing and not feel guilty. This leads to another question. If this lesser known brand from Martinique beats the taste out of the other ones and is priced this low, how much are those other brands ripping everyone off? I am so glad that I did not abandon my search for a great rhum agricole at a sensible price. Update February 13, 2019: Out of the 10 Martinquan rhum agricoles that I have tried, this is the only deserving of my rating of an 8. This also includes going up against 3 from Haiti, 2 from Louisiana and 1 from Florida. Earthy, woodsy, grassy common with Agricole and cachaca rhums. This has a nice flavor which I'm sure has something to do with the sweet and flavorful blue sugarcane and fertile volcanic soil. Class act that should be included in everyone's collection, house rhum and liquor cabinet. There are better one to try and talk about. Life is short. I guess I should have prepared myself for what a Rhum Agricole tastes like. The grassy flavor was not what I had anticipated. It definitely is a sipping rhum, not one for mixed drinks as it overpowers whatever you mix it with. It was touted as "the best" on an NPR segment so I bought 4 bottles of it without having tasted it - mistake. One bottle would have been plenty. I am not disappointed that I added it to my repertoire of rums/rhums but I will have to revisit sipping it again with a different attitude. A nice treat to stumble upon. Not a sweet rum, but a beautiful rum from deep roots that go way back to a time and place where rum was born. Made from blue cane juice, not molasses, gets a tip of the hat and nod from me every time... even though I like the sweeter rums... this one gets my respect. Yummy. Light, smooth, tasty. Very little of the noxious vegetality which can sometimes overpower unaged agricoles. This rum - err rhum - is very easy to sip neat. It's dry, with oak and butter overtones. Probably too mild for those rhum fans who want more grass in their glass, but it's just right for me. First off, the aroma in the bottle is enticing...almost buttery sweet...sort of a butter-sugar toast. I like it. Then the flavor. First thing that hits you is a nice natural sweetness with hints of vanilla and toffee from the blue cane but then that turns into a nice spiciness before the oak flavor hits and causes your tongue to tingle. Then the warmth hits your throat slowly fading into a buttery spicy goodness. That's what I mean by complex. And I can imagine someone with a more educate palate than mine would be able to distinguish even more levels of flavor. This is a very good agricole rum that would work well by itself as a sipping rum as well as a rum used in mixed drinks and colas. Definitely versatile. Even though I have not tried one myself I imagine this would be an excellent rum for hot toddys. This was my first agricole and it took many more agricoles and cachacas before I embracd the flavor profile, now I search for them everywhere. Depaz Blue Cane Agricole is a well balanced rum with a hint of oak. Color: Very light brown, slightly yellow. Bottle Aroma: Immediate grassy, earthy must, slight oak. Glass Aroma: Agricole style starts to open up, slight alcohol odor. Taste: Similar to a cachaca, light flavor with a slow transition to the heat, very mild oak throughout, light heat in the throat. Very, very drinkable rum and an excellent oak balance. I have come back to this rum and am glad to have done so. First, if you don't like agricole, you probably won't like anything in this category. The Depaz is grassy, but remains soft and drinkable on the rocks. It is more subtle than most agricole. If you are looking for a big grassy and vegetal rhum, this won't be your favorite. I found this in DE. It is good in cola and would likely be good in mojitos as someone else mentioned.